Add two large handfuls of halved or sliced strawberries, depending on their size to a large jug with a large handful of fresh raspberries, a few sprigs of fresh mint and ¼ cucumber, sliced and cut into 4. Add Pimms No1 and fizzy lemonade or tonic in proportions specified on the bottle of Pimms then top up with lots of ice cubes. 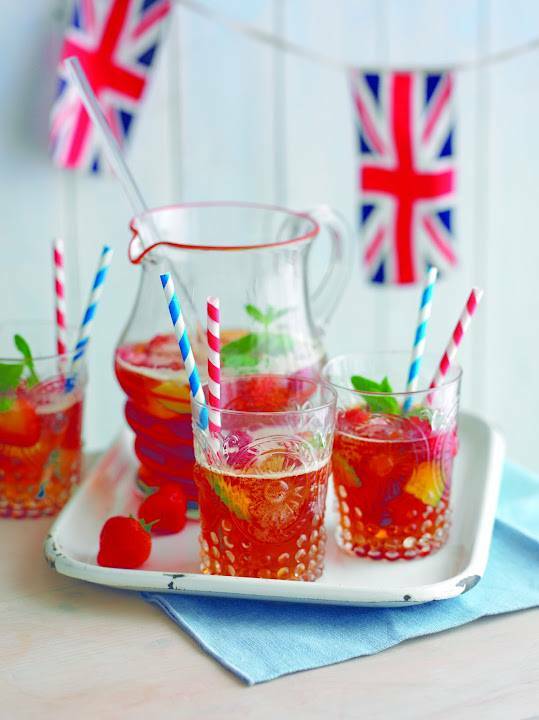 Jazz up summery drinks by adding small halved strawberries, raspberries and mint leaves or tiny viola or herb flowers to sections of an ice cube tray. Top up with cold water, freeze until solid then press out of ice cube tray and serve in a small bowl or add straight to a glass of strawberryade, see below, bought elderflower cordial or a G and T.
Refreshingly simple and easy to make. Crush the strawberries roughly with a potato masher or handheld wand mixer in a bowl. Pare the rind thinly from half the lemons with a vegetable peeler making sure to leave as much white pith behind as possible or this will the make the strawberryade bitter. Halve and squeeze the juice from all the lemons then mix into the strawberries with the sugar. Pour on the boiling water, stir well to mix then cover and leave to cool place. Transfer to the fridge overnight. Next day, strain if liked, and pour into a bottle, seal and chill in the fridge until needed. Serve undiluted with ice or mixed half and half with sparkling water for children. "Creative Mondays Blog Hop #week 18 : Mushroom Bolonese Hot Pot Style…"
"4th July Berry Waffles: American Independence Day"
Oh my! These look absolutely delicious! 🙂 YUM! You've made this look like a very inviting drink. Fantastic composition and colors.